Have you ever woken up with neck and shoulder pain? Or low back pain? Then look no further - Serenity Services can help ease those aches and pains away. We have a clinic in Redhill and we are on the border of Reigate so not far to travel. We are just round the corner from Donyngs so its easy to get to and only a 10 minute walk from Redhill town centre. If you're working in Redhill why not have a massage in your lunch hour or come for a massage after work. We are open 7 days a week 12 noon til 8.30pm weekdays and 12 - 6 at the weekend. Over the past 10 years we have built up an excellent reputation for providing therapeutic massage, sports massage, pregnancy massage, reflexology and advanced clinical massage to the general public in Redhill and Merstham and surrounding areas. 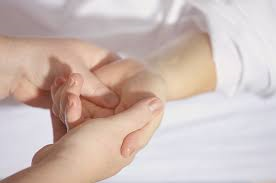 Massage has been proven to bring comforting relief from back, neck, shoulder, leg and arm pain without medication. It can put you into a deep sense of relaxation, reduce stress and anxiety, relieve muscle tension, stiffness and pain, improve circulation of both blood and lymph, detox the body, give you greater joint flexibility and range of movement, help reduce blood pressure, relieve headaches, help improve posture, nourish your skin, help strengthen your immune system and increase awareness of mind-body connection. Massage can be used to promote good health and a sense of well-being as well as treat injured, painful muscles and stress. Make a positive lifestyle choice today and book an appointment or buy a gift voucher from Serenity Services today.